As the Perfect Game All-American Classic to continues to grow so does the talent taking the fields at the college level. Last year in this same feature 76 former PG All-Americans were listed. This year that number has grown to 80 and covers the NCAA Divisions I and II, NAIA and NJCAA levels of the sport. Also included is one college football quarterback, Brandon McIlwain, now at Cal, who showed off his talents swinging the bat, to go along with his game-changing speed, as he hit an opposite field triple in the 2015 Classic. Last year saw a pair of PG All-Americans named First Team College All-Americans, with Greg Deichmann and David Peterson both enjoying huge seasons for LSU and Oregon respectively. Carlos Cortes was named a Freshman All-American after hitting .286-12-41 for South Carolina while Tyler Baum, Austin Bergner and Dominic Fletcher were named Summer Collegiate All-Americans. 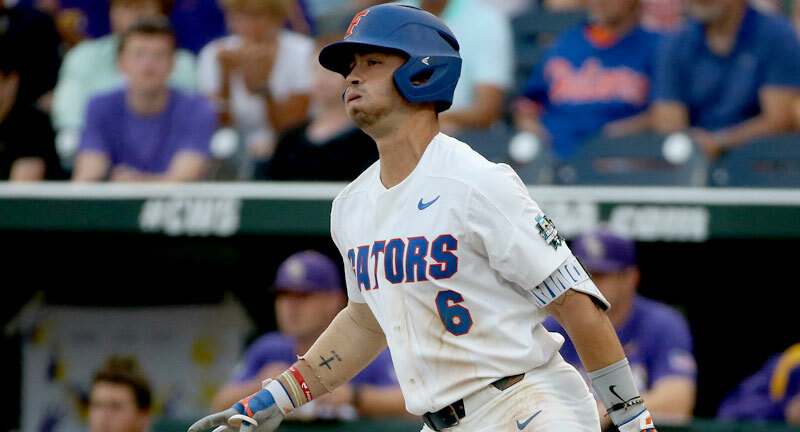 Of the 80 players listed below eight of them were members of teams that advanced to the College World Series – which doesn't factor in the players that were part of those teams that have since moved on to professional baseball – including Jonathan India of the CWS champion Florida Gators. Zack Hess served as the closer down the stretch for the runner-up LSU Tigers and Drew Mendoza provided some huge hits for Florida State to help propel them through the NCAA postseason. Twenty of the players are incoming freshmen and represent the next wave of talent at the college level. For the second year in a row TCU leads the way with five former PG All-Americans on their roster, and not surprisingly the Horned Frogs will open the 2018 season once again on a short list of teams expected to win it all in Omaha. Players filtered by school. Year indicates the year each player participated in the Classic.